If you have followed me on Instagram, you may have noticed a recurring theme or two. One of which is Autumn, but the second, which is much more obvious, is a little yellow beanie. I hate to say it, but I don't think either will be disappearing anytime soon. I've been on the lookout for a good hat for Harrison for the last few months, he has loads in darker colours and a few in baby blue, but neither really go with the majority of his clothes for A/W and I couldn't help but pick up this Mustard beanie when I saw it in River Island Mini. 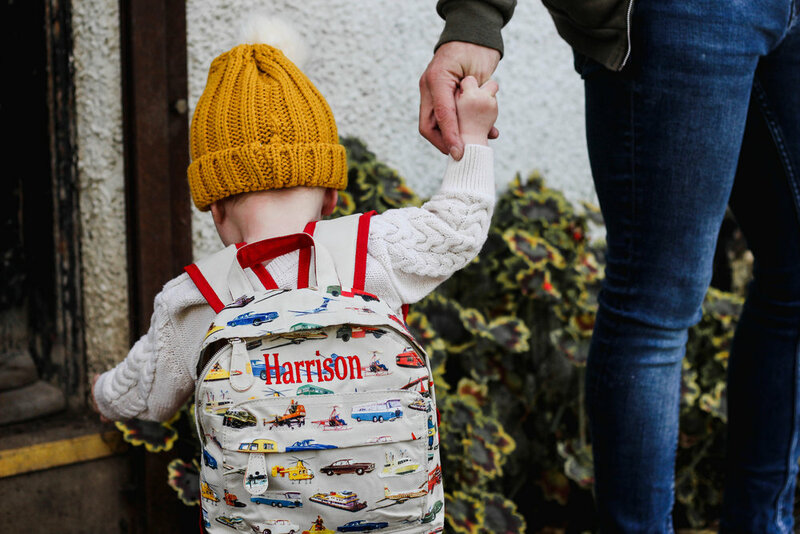 It's a lovely chunky knit and has plenty of growing space left in it, they sell in one size so I'm confident even with Harrisons' larger than average head we'll get a decent amount of wear out of it. They also happen to have a matching hat in the Women's section and I'm not ashamed to say it's gone straight in my basket. With Harrison, it was the 'accessories' that I always loved picking. His hats and shoes especially. As he's gotten bigger, both have gotten slightly more difficult and I've found myself becoming a lot more picky with what we buy. Harrison is also wearing a cable knit jumper from Gap, which he has worn to death in the last month and will probably continue to do so. We were sent the jumper as part of an Instagram campaign for them, but it's been one of my favorite pieces of clothing for him to date. This weekend the weather was great and he was able to get away with no jacket, so the jumper gave that extra bit of warmth he needed. He's got an old pair of khaki trousers from Next (oh the irony of calling an 11 month old's clothes 'old') that we picked up for a few pounds in the sale and these were well and truly done after kicking about in the mud on this day.